Wool crafts may not be the first thing you think about in summer, but soap felting is a fun, wet project for kids and adults. Soap covered in wool felt. It is like a wash cloth and soap in one. The wool felt shrinks down with the bar of soap, so you have less soap waste. The felt keeps the soap from being slippery. You can add some pizazz to your boring soap. Kids LOVE making it-it is messy! 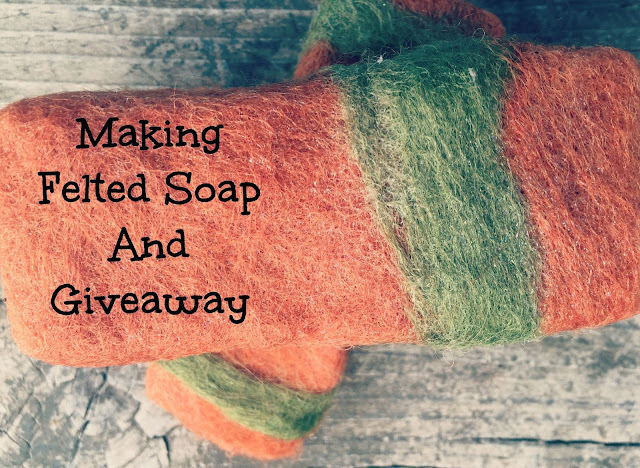 There are several ways to make felted soap. I read and watched many tutorials on how others have done it. It really is simple and though there are quite a few different techniques that people use, the end result is about the same. I am sharing what has worked best for me. I had some goats milk soap on hand, that was a little on the soft side, even after letting it cure, so I decided to felt it. I have used other types of soap and they all work- handmade, purchased, round and rectangular. As long as it suds it should work! I used Corriedale cross roving that I processed and dyed. Most wool roving will felt, but some does felt quicker than others. 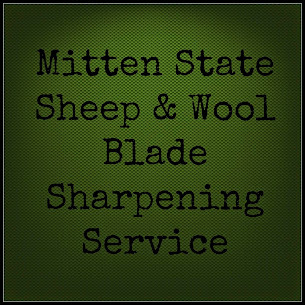 The Corriedale works great. First, pull off a piece of wool roving, and layer the wool. I lay the wool criss cross (thin layers) to set the soap on. Wrap the soap in the thin layers of wool until you can no longer see the soap. You can embellish by adding some different colors of wool. Carefully, put the wool into the foot of the nylon stocking. At this time, I twist the nylon at the base of the soap and fold the nylon over the soap to keep the wool from shifting around too much. Next, I wet my hands and dip the ends of the soap in the hot water. Start rubbing the soap gently adding a little water if needed. When you first start you want to be careful that the wool does not shift around too much in the stocking. Continue rubbing the soap. I like to do two bars at once. The friction from the other bar, seems to help the felting process along. It will get very sudsy! Work the soap until the wool has felted. 10 minutes should do it. Rinse the bar of soap, pat with towel, and let dry. My first attempt at felted soap, the wool was not quite felted enough (no patience) I used it anyway. As it was used, it continued to felt. There really is no way to mess it up! Even the less than perfect bars can be used. If you want to get creative, you can add flowers, polka dots etc. on the finished bars of soap using needle felting techniques. I have seen some pretty amazing bars of felted soap. I am not much of a needle felter, so I leave them just the way they are. I am giving away one kit to three readers, enter below if interested. Not sure I got my entry in or not. I don't have facebook. Very neat idea! This is a great time of year for this tutorial with handmade soap available at farmer's markets. I like your simple, clear instructions. Now, that is cool! I've never felted soap, and would love to be entered. Thank you for taking the time to do the tutorial. Sounds interesting and would be a great project and very useful. I would love to be entered. Great Job! I always like to try new things and this does not seem messy! My two fave colors are mint green and purple! This is a fun idea! I love blues and purples. Wow your felted soap is amazing. Thanks for sharing with us at Cooking and Crafting with J & J.